Below are some examples of garments by local designers made using our organic Shetland wool. 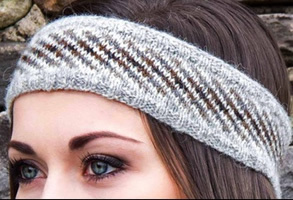 Head band designed and hand knitted by Belle Gregson, chevron pattern in natural coloured organic jumper-weight . Picture by Charlie Inkster. 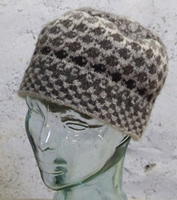 Hat designed and hand knitted by Deborah Briggs, swimming fish pattern in natural coloured organic jumper-weight. Organic Shetland tweed woven by Isle of Mull Weavers in natural colours. We have also created a new marketing site under the branding of Wool Matters. Visit Wool Matters here at www.shetlandorganics.co.uk. See a selection of our organic yarns here.